I need help calculating the correct diameter of spur gear so that my potentiometer gets near 300 degrees rotation as it travels the length of a 300mm rack. I'm building a custom flight yoke and this is for Yaw control. As I push the yoke shaft in or pull back the carriage will have the Potentiometer with spur gear that rolls down the rack gear as input. 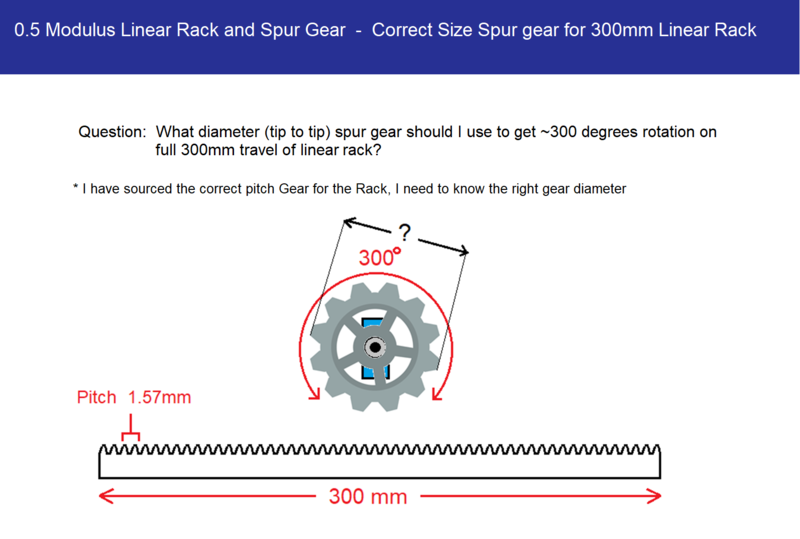 Re: Rack and Spur Gear - Help with Maths! Have you thought about using a string pot instead of the gear assembly you described. So much easier to build with. Gwyn, This is amazing.. you described it perfectly. Thank you. Page created in 5.905 seconds with 25 queries.